I was in Taipei and then Seoul with my off sider Dave, a man normally a focused sales professional who enjoys a drink in the evening. I have never had much fun outside of work other than “pubbing” and dinner with him. The trip to Taiwan was business as usual, however travelling to Seoul he admitted to me that he really disliked the city and that it was the worse place he ever travelled to. Seoul is a car centric city that looks and feels very grey; it has the permanent feel of winter about it. Under a sky that has forgotten the sun, there are vast areas of grey tall apartments standing in rows like guards along a grey dead river. Previous experience of the South Korean capital gave us the feeling it lacks the old Chinese world character of the Chinese and Taiwanese cities we have visited. That night we decided we would try and find some soul in Seoul and headed out on foot to a likely looking area behind the hotel. Wow we found it, a huge area of alleys and markets that extended miles in all directions. Neon lit and absolutely buzzing, this is a place to spend hours wandering through the alleys of shops, stalls and street hawkers. We had a few drinks at Korean pubs it was great. 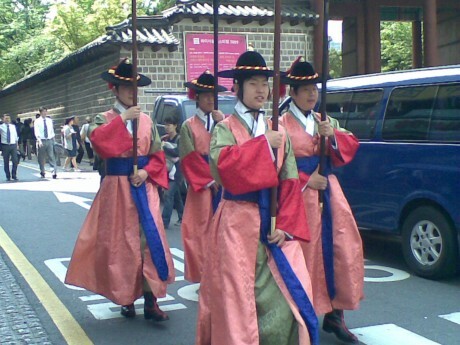 On May Day we found a replica Korean village called Namsangol Hanok Village, we had an English speaking Korean guide. His name was Ho Park; everybody in Seoul seems to be a Park. He told us his name meant “Pumpkin” so we dubbed him Mr Pumpkin. Mr Pumpkin was a wonderful old man, who had retired and was doing the guiding as a volunteer, teaching the English speaking about Korea. From this point I am not offering the words as fact, but as the teachings of Mr Pumpkin. The first important lesson to learn is that the Korean language is one of the simplest to write. Well if you look at it, the calligraphy looks like a series of the squiggles and circles, however apparently, according to Mr Pumpkin the written language has only 24 characters and of those eight are vowels leaving the other two thirds as consonants. Simple really, well if you understood the language it might be simple, but we didn’t so I am afraid after Mr Pumpkins instruction we were none the wiser. The next lesson was on building things, like houses and things like that. This was something Dave and I could understand, the subject peaked our interest immediately. 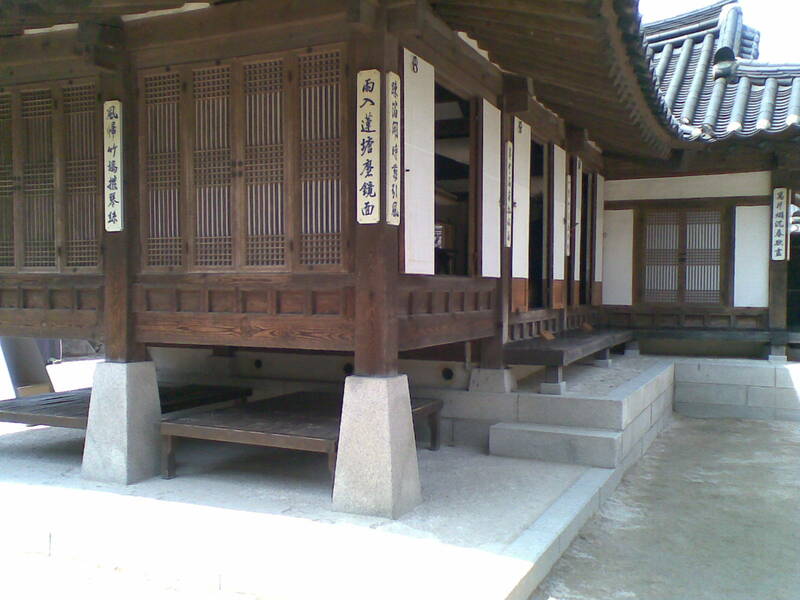 The traditional houses we saw apparently are movable. You could dismantle them and shift them to another location, and as proof of this situation the houses in this mock village had been moved here and were the genuine four hundred year old article. I accepted this and was prepared to go along with it, however as I gazed passed these houses into the great city of Seoul it seemed not quite plausible that those sky scrapers were about to be shifted any time soon, nor did it seem possible. Although on complete reflection, and in fairness to Mr Pumpkins explanation, I do know of an eight story office block physically moved across the road in Wellington New Zealand. Pointing to the roof lines Mr Pumpkin, showed us the roof lines were not straight but had a dip in the middle. This is apparently an architectural difference with Chinese buildings; it gives a more panoramic view of the building as at a distant it appears as a straight roof line. Hmmm interesting, I didn’t point out that close up the Korean buildings appeared to have a dip in them where as Chinese ones did not. Brightly painted, the ceilings of the buildings are a similar style to the Chinese building, paint with murals of different scenes, predominately in blues and aqua’s. These ceilings had chicken net in them to prevent Pigeons roosting in them. I could not determine if this had always been the case or was a recent innovation. There was however no Pigeons about and I could only surmise this is due to the lack of places to roost. The buildings in this village are all from royals, most of them minor royals but royals none the less. How do I know this, it is easy really. Raising the building from the ground allows air flow underneath them, similar in concept to the homes in country Queensland. The number of steps into the building relates to the social order of Korean society. The more steps, the higher the class, in the case of these buildings have three steps for royals with some that have a single steps; accommodation for the servants. Built around a courtyard, the building walls on the courtyard side opened into the room and upwards to the ceiling opening the side the four-part buildings to the quadrangular courtyard. This ingenious way of opening the doors created space in the rooms. The living quarters had wooden floors, where air flowed under to keep them cool; the sleeping areas had stone floors with a fire and ducting under them to heat them in winter. The ducting channelled heat from external fires under floors to a chimney stack outside the courtyard and away from the building. Simply brilliant, the kitchen also channelled the smoke and the left over heat to underfloor heating, very smart design. The building sat on small square stone piles; some floors like the kitchen are crushed rock, granite I presumed, as according to Mr Pumpkin there is a wide predominance of granite in South Korea. I asked the obvious question an Australian, especially a Queenslander would ask. “These are outside the house” this was the only explanation Mr Pumpkin would give us. I felt a little affinity here for Koreans, as they must have had thunderboxes in the yard just like the Aussies. Mr Pumpkin insisted that there were no steel nails used to construct of these houses and as proof he offered the wooden flooring. 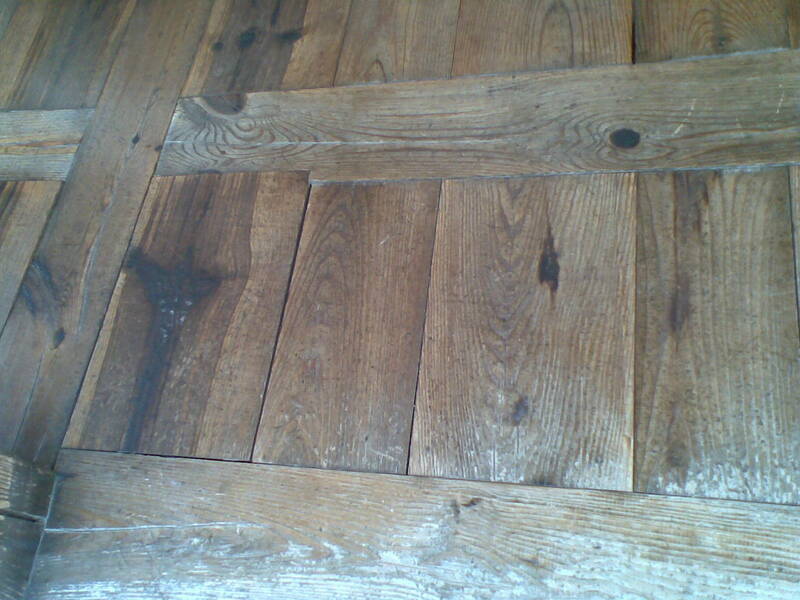 Wooden floors consisted of parallel planks that ran along the length of the building, separated by horizontal planks with had a tongue that slide into a grove along the parallel planks. The end horizontal plank of such an arrangement was wider than the rest and fitted into a slot to key it into the arrangement. Looked very impressive, but must have been trick to fabricate. Another interesting concept that they had was the notion that after seven years the married couple really had not much else to say to each other and therefore would life in distinctly separate parts of the house. There own sleeping, entertaining and living quarters, this to me again seemed to fit the Aussie way although we are a little less up front about its application. The site of a time capsule in remembrance of Seoul’s 600 Year Anniversary, buried in 1994, to be opened four hundred years later our last sight to see. Dave and I both promised to book our flights to come back for the opening and shortly after we thanked Mr Pumpkin and bade him farewell. After a couple of hours walking around the village, we walked back towards our hotel, and found our selves back in the markets from the night before. In the afternoon we headed in a different direction and five minutes from our hotel we found an ancient palace, so did thousands of Koreans so I don’t think we were first. They were changing the guard when we arrived at Deoksuguns Palace, with due ceremony and ancient uniforms. The guards then hung around for photo opportunity with the kids and those who still would like to be kids. For the princely sum of 1 dollar we got into the palace for a look see. 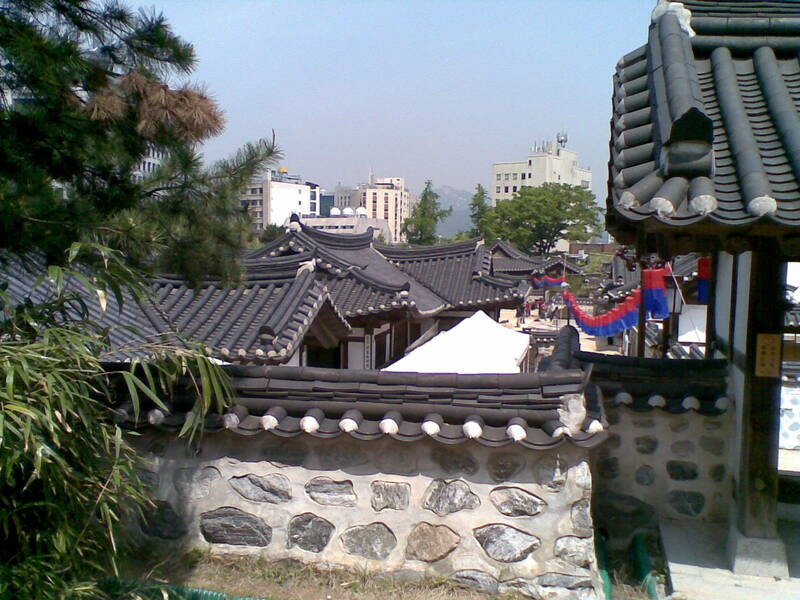 Built in the 1400’s, this place burnt down, rebuilt, left and regained several times over the ages, but none the less it was a one of the Royal Palaces in Seoul. We knew it was royal, we had our lessons from Mr Pumpkin and we had learnt to count the steps, most of them were three, however we did find one that was four. We surmised this must have been the building for an even high being. By the time we had been through this place it was time to head back to the hotel and pick up our car to the airport. It was a great 24 hours and we both thoroughly enjoyed it. Speaking in the car on the way out to the airport we both agreed that we had completely changed our mind on Seoul and the people. Amazing what getting out of the hotel does for you.